Queens Botanical Garden offers workshops and tours for groups throughout the year. The information below will help you prepare for a group visit. We hope to see you soon at Queens Botanical Garden. Workshops start promptly and last approximately 1.5 to 2 hours, depending on the workshop. Each workshop includes an outdoor component, a discussion and a hands-on activity. Most QBG workshops can be customized for grades Pre-K through 12. Tours are entirely outdoor experiences that are 1 hour long, unless otherwise indicated. Outreach workshops are available on a limited basis. Please contact [email protected] for more information. All groups, unless otherwise specified on the invoice, MUST be dropped off at the Parking Garden, located at 42-80 Crommelin Street (see map below for details). Buses must drop off visitors in the Parking Garden bus loop, but we are unable to accommodate bus parking. Car parking is available for an additional fee. Instructors will meet groups scheduled for Workshops and Guided Tours in the Parking Garden. If you are here for a tour, please exchange contact information with your bus driver in case of sudden shower or weather change. There are no indoor facilities for tour groups. Public restrooms are located in the Visitor & Administration Building. Please allow time before and after your program for restroom use. Groups arriving late will receive a shortened program that will end at the originally scheduled time. Groups arriving more than 30 minutes late for their scheduled program will be cancelled. Refunds are not available. Tours take place entirely outdoors. Workshops have an indoor and outdoor component. Workshops take place rain or shine. Please encourage participants to dress appropriately for the weather. QBG does not have an indoor lunch facility or any food for purchase on site. Weather permitting, groups are welcome to sit and eat on the grass in the Crabapple Grove. If you plan to eat on the grounds, it is recommended that you have an alternate plan in case of inclement weather. Visitor safety is our top priority. Leaders and chaperones are responsible for their groups and must supervise children at all times. Children must stay with their group and are expected to observe all Garden guidelines. They may leave the group only with chaperone supervision. During your program, we ask that all cell phones be turned off or silenced. • Ball playing, sledding, kite flying, etc. 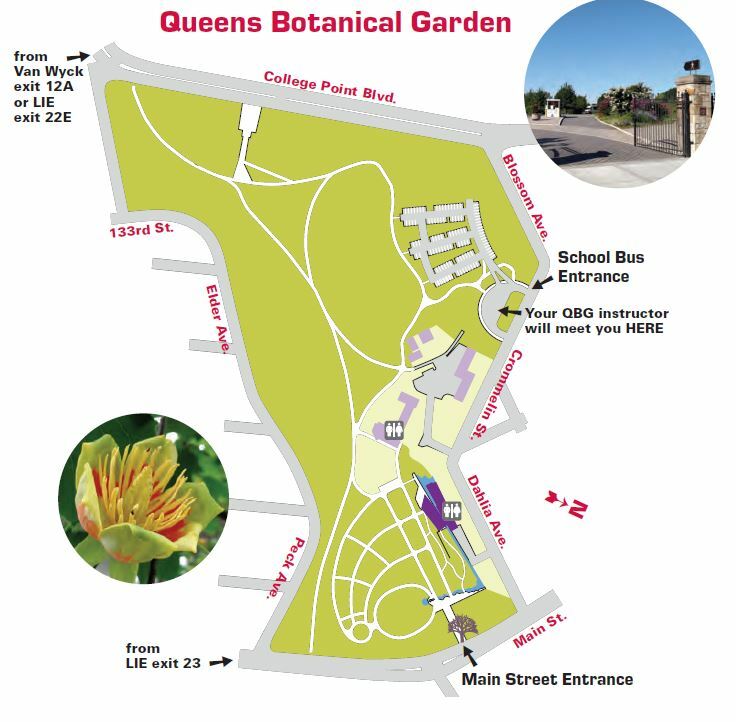 Queens Botanical Garden is located at 43-50 Main Street, Flushing, NY 11355.